Keeps Me Smiling: Why Waikiki? It's crowded. The beach is shrinking. It's too touristy. It's expensive. It's hot, especially in August. Then WHY? 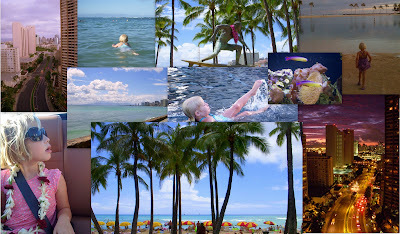 Why would you choose Waikiki Beach in Oahu rather than Maui, Kauai, or the Big Island for a family vacation destination? I raised the same question during the five hour airline delay to get out here. I also had some doubts about the bill, since our travel budget has been rather expansive this summer. Arriving to rush hour traffic and getting misdirected at the hotel didn't help. But once the burden of the travel day was behind us, the answers started to unfold. How is it possible that a single day, from sun-up to sun-down, could have reversed the headaches of such a troublesome travel day? It's a valid question, and I'm having a heck of a good time finding out the answers for you. Next stop, Hanauma Bay! Don't forget to hang five over at Delicious Baby's Photo Friday. That looks LOVELY. I'll bet your hubby gets some surfing in! Sounds fabulous, sign me up! More pictures, more pictures! Especially of you and Pick on boards! I think the collage said it all. Look at those pictures!! Oh! I'm so green with envy. :) Enjoy your vacation and I can't wait to hear all about it. You are like the 10th post I have read about Hawaii lately...must make a trip soon! We even have friends there that we could visit. I can't wait to see your posts about the trip. I've actually NEVER been to Waikiki. Only to the Big Island. Though I'm dying to take a weekend trip from CA to Maui, as it's supposed to have some of the best diving in this region of the world. Have fun! BD & DB, will take more pics and yes, the surfboard is doing its duty! Sarah - yes we are here can't wait to see you today! I removed your phone number though for privacy purposes. Amy - the collage was fun - it was the first time I tried that function in Picasa Photo Editor. Kymri - my husband agrees with you! Jen, would love to lend some insight if you plan a trip. Camels & Choc - well it's not quite Norway, but there is certainly plenty of aloha spirit! i've not been yet, but we can't wait to go. i hope you have a wonderful time! with all the negatives you mentioned, I would still go and I'm sure would be rewarded as well! This post definately got my attention, as I have also wondered the appeal of LA meets Hawaii. Your experience may have changed a lot of views. My husband went to Hawaii for family vacations growing up and has such fond memories. I ask the same question. And will be posting about it soon on my blog as well. I think the key to Waikiki is to use it as a home base and try to get out ino the real Oahu as much as possible. Normally I wouldn't choose Waikiki as my Hawaii destination but when its free, I happily take it. My husband was there for work so all I had to do was pay for my meals and a flight. Not bad.